According to local media, the Federación Mexicana de Fútbol (FMF) president Justino Compeán has said that Mexico is going to bid to host the 2026 soccer World Cup. He is quoted as saying that, “Mexico was a great host in 1970 and 1986, so we are indeed going to bid.” It is worth noting that Mexico also put in initial bids for the 2018 and 2022 tournaments, but later withdrew prior to final voting. Hmm… perhaps the Telegraph sports journalists had better get their atlases out and take a good look, since Mexico is quite definitely in North America! 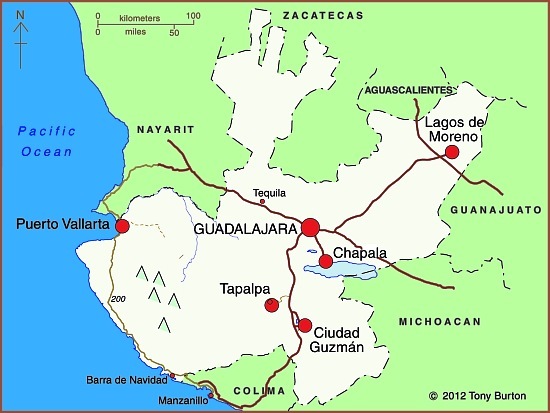 The XVI Pan American Games were held from October 14–30, 2011 in Guadalajara (Jalisco) with some events held in outlying locations such as Ciudad Guzmán, Puerto Vallarta, Lagos de Moreno and Tapalpa. They were the largest multi-sport event of 2011. Some 6,000 athletes from 42 nations participated in 36 sports. The largest contingents of athletes (more than 500 in each case) came from host nation Mexico, Brazil, Argentina, the USA, Cuba and Canada. Guadalajara is Mexico’s second city, a metropolitan area of almost five million people, the industrial and commercial hub of a region that is considered quintessentially Mexican, home to charrería (Mexican horsemanship), jarabe tapatío (Mexican hat dance), mariachi music, and tequila, the national drink. This post looks at the impacts of the Pan American Games on the local economy. How much investment was required to host the games? The original budget for the Games was $250 million (dollars), but this ballooned to about one billion by the time of the Opening Ceremony. The security budget was $10 million, to pay 10,000 municipal, state and federal police, as well as elements from the Mexican army and navy, to patrol the streets surrounding the venues during the games. How many visitors attended the Games? The State Tourism Secretariat expected 800,000 visitors and spending of $75 million (dollars). Some government spokespersons claimed that between 1 and 1.5 million attended the games. However, a study released by the Guadalajara Chamber of Commerce found that 454,148 visitors came to Guadalajara during the games (305,177 from the state of Jalisco, and 148,971 from elsewhere). 83% (424,354) of visitors came “specifically for the Games”. How many jobs were created? The build-up to the games created some 50,000 new jobs. In addition, more than 6,000 volunteers, mainly students, were employed during the games. How much were the media and TV rights worth? 1,300 media representatives attended the games. More than 750 television hours of sports were broadcast, with global digital media company Terra broadcasting the games live in 13 simultaneous high-definition online channels. The TV rights were worth $50 million. How many sports venues were used? There were 32 different venues used during the games. Billions of pesos were spent building 19 impressive new sports stadiums and complexes. Thirteen existing sports arenas in the Guadalajara metro area were rebuilt or extensively refurbished. The opening and closing ceremonies for the Pan American Games were held in a 48,000-seat local soccer stadium, the Omnilife Stadium (Estadio Omnilife), built in 2010 for the Guadalajara “Chivas” soccer team. Facilities built specifically for the games included an iconic Aquatics Center (Centro Acuático), sponsored by Scotiabank, with two Olympic-size pools and seating up to 3,500 spectators, and a state-of-the-art gymnastics venue, sponsored by Nissan. How did the games help regional development? How much did visitors to the games spend? Local businesses reported sales up 7% during the period of the Games. The total games-related spending by visitors was estimated at $210 million (dollars). Hotel occupancy rates for the period of the games rose from 58.3% in 2010 to 76.4% during the games. The rate was 97% for the 5-star hotels in Guadalajara and Puerto Vallarta. Even so, according to a local newspaper (The Guadalajara Reporter), local business owners were “underwhelmed” by the Pan American Games’ impact. Restaurants, bars, clubs, taxis and travel agencies all received fewer customers than anticipated. Local business owners said that “very few foreign tourists came for the games, while most spectators at the events were local citizens, athletes and their families, journalists and other games-affiliated personnel.” Business owners in Puerto Vallarta were reported to be “angry at the lack of publicity for the destination”. The Pan American Athletes Village (Villa Panamericana) was built one kilometer outside Guadalajara’s western ring-road (Periférico) to house all 6,000 participants. The location is conveniently close to the Omnilife Stadium, site of the opening and closing ceremonies. The Athletes Village has three-bedroom apartments, a central plaza, restaurant, gym, discotheque, chapel, swimming pool, theater and health clinic. The original plan was for the Village apartments to be sold after the Games for between $90,000 and $250,000 (dollars) each. However, the fate of the Athletes Village is still uncertain, because residents of the nearby (and long-established) Rancho Contento subdivision have taken the owners to court, demanding that the Athletes Village be demolished since it has already caused irreparable damage to the local ecosystem. Apart from some issues of housing density in this area, the main concern is that the village has inadequate provision for sewage. After the Games ended, local newspapers reported that faulty treatment plants had resulted in sewage being pumped out of the village on to land inside the nearby Primavera Forest biosphere reserve. Apparently, two of the Village’s treatment plants “collapsed” under the volume of wastewater generated, and partially-treated sewage had collected as open ponds. It is unclear if the sewage contaminated local subsoil and streams. After the Games, city officials closed the plants and fined the Athletes Village administrators. The administrators claim that the plants and Village had been designed to accommodate only 2500 to 3000 athletes, not the 6000 participants that were later housed there. The lasting legacy of the games is a number of new hotels in Guadalajara, including hotels in the Westin and Riu chains, and a number of new or upgraded sports venues. In addition, many roads were repaved and numerous other beautification projects have helped improve Guadalajara’s urban fabric and infrastructure. The city’s main exhibition space (Expo Guadalajara) and the international airport have both been expanded. The first obvious benefit of these improvements has been that the city (and its new Aquatics Center) have been chosen to host the 2017 World Swimming Championships. Veteran British fútbol (soccer) commentator John Helm needs to get his atlas out. Giving the international commentary for the recent FIFA World Cup game between Mexico and Uruguay, he repeatedly described Mexico as being “in Central America.” This is all the more shocking given than Helm was part of the ITV commentary team at the 1986 World Cup matches held in Mexico. To make matters worse, Mexico’s own geography wasn’t too great in the match either. Many shots were way off target, and several passes went straight to the opposition. Mexico lost 1-0, but still advance to the round of 16 where they will face Argentina. The Mexican Wave is one of Mexico’s best-known contributions to world culture and sports. Amazingly, studies of the Mexican wave may also suggest how to control unruly mobs. Defined as “a rippling wave effect that passes right around a stadium full of spectators, achieved when all the spectators in turn stand up with their arms raised and then sit down again with their arms lowered” (Chambers 21st Century Dictionary), the Mexican wave or La Ola is a cooperative, coordinated and spectacular sight that gained popularity after the 1986 World Cup fútbol (soccer) competition held in Mexico. The historical origins of this seemingly spontaneous social ritual are disputed, but it certainly predates the 1986 World Cup and was originally called either the “human wave”, or simply “the wave”, rather than the Mexican wave. Numerous independent claims have been made as to who was the first to orchestrate it. The rival claims include those of the fans of Seattle Mariners baseball team; the “yell-leader” Rob Weller and marching band director Bill Bissell of the University of Washington’s “Huskies” American football team, and “Krazy” George Henderson at an Oakland versus New York baseball game. Whatever the truth, the wave was certainly widely practised in the early 1980s by American football crowds. Mexicans reading this post may prefer to accept the (as yet unsubstantiated) version claimed by one Alan López, in a contribution to the UK Guardian’s forum on ” When and where did the first Mexican wave start?” López attributes the first wave to fans watching a local derby soccer match between Monterrey and Tigres in the city of Monterrey, Mexico, in the 1970s. The wave’s rise to prominence on the world stage came during the World Cup finals in 1986, when it was regularly performed in Mexico City’s main stadium, the Azteca (where yours “soccer-mad” truly was lucky enough to be a willing participant on several occasions!) and where, of course, it received extensive television coverage. The persuasive power of television is well known and the term Mexican wave soon entered the vernacular vocabulary, an end-of-the-twentieth-century phenomenon that has transformed how spectators react in sports stadiums around the globe. The historical origins of the Mexican wave may be disputed but the origin of each individual “wave event” is now much better understood as a result of some pioneering mathematical modeling performed by a team of two biological physicists from Hungary together with an economics and traffic researcher from Germany. The webpage Mexican waves in an excitable medium includes a video clip and animated graphic showing a typical Mexican wave. It also features fascinating interactive graphics to show how various mathematical variables affect the probability, form, and speed of travel of Mexican waves in a hypothetical sports stadium. In physics terminology, the Mexican wave is an example of a transverse wave: the spectators move only vertically (standing up and then sitting down again) but the wave travels horizontally around the stadium. Researchers studied video footage of 14 wave events and built a mathematical model that mimics their development and subsequent movement, similar to the models used for predicting the movements of heart tissue or a forest fire. They found that three out of every four waves travel clockwise around the stadium (partly because the majority of people are right-handed) and that they typically move about 12 meters (20 seats) per second. Interestingly, it requires only 30 or so fans standing up simultaneously to start the ripple effect leading to a fully fledged wave. The success of their computer models means that future studies may lead to methods of predicting how unrest will spread in an excited crowd and precisely how security personnel can best keep tense situations under control. So, we now know that you only need a small core group of die-hard fans to start a wave. And the records for longest wave and largest wave? Assuming that it’s acceptable for Mexican waves to occur outside the confines of a sports stadium (a debatable proposition), both records are probably held by the more than 250,000 spectators who lined the 40-kilometer-long (25-mile-long) route through the streets of Mexico City that was traveled by Pope John Paul II when he visited the city in July 2002. It is only fitting that Mexicans retain full control of the records related to the Mexican wave! The term Mexican wave has been used for many other things besides the crowd behavior phenomenon described in this post. For example, it has been used by molecular enzymologists to describe the characteristic motion in a “Model for ssDNA translocation” (whatever that is!) and for a kind of acrylic yarn, manufactured in several variegated patterns, that can be machine washed, laid flat to dry, and is considered excellent value for money! In addition, while it lasted, Mexican Wave was the UK’s leading website about Mexico. Finally, if you want to do the Mexican wave and don’t have any willing co-participants, then try some fancy facial gymnastics, by following the instructions on ” How to do an eyebrow Mexican wave”? on a BBC website! Whenever, wherever and however you next participate in a Mexican wave… have fun! Rubber balls wouldn’t bounce very high at all if it wasn’t for some Mexican ingenuity. Think of the hours of pleasure that a simple rubber ball gave you as a child. Would you have had as much fun if it hadn’t bounced? I don’t think so… but what’s the secret ingredient? It has long been known that the pre-Columbian peoples of Mexico had rubber objects, including balls. The basic ingredient was the sap or latex of the native Panama Rubber Tree (Castilla elastica). A few years ago, Dorothy Hosler, an associate professor of archeology and ancient technology at the Massachusetts Institute of Technology, and two of her colleagues, chemist Sandra Burkett and undergraduate student Michael Tarkanian, realized that unprocessed pure latex is sticky and becomes brittle when dry. Put simply, balls made of pure latex don’t bounce, but shatter. So, they then set out to tackle the mystery of what makes rubber balls bounce. In a landmark paper entitled, “Prehistoric Polymers: Rubber Processing in Ancient Mesoamerica,” published in the June 18, 1999, issue of Science, they revealed how a little Mexican ingenuity turned sticky, brittle latex into a stretchy elastic. Put simply, they revealed what made rubber balls bounce. The magic ingredient is a little sap from the Morning Glory (Moonflower) vine! The addition of sap to latex begins complex chemical changes that provide a much improved material for tools, figurines and medicines, in a process akin to vulcanization, invented three thousand years later by Charles Goodrich. The addition of Morning Glory (Ipomoea alba) sap to otherwise brittle rubber also resulted in balls suitable for the development of Mexico’s ancient sport of Ulama. 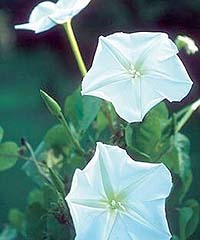 Ipomoea alba, the tropical white-flowering morning glory (moonflower or moon vine). How did Hosler’s team arrive at this startling conclusion? Documentary sources and ethnographic research suggested that Indians mixed natural latex with the juice of the morning glory vine, a plant prized for its curing properties. The researchers crushed some Morning Glory vines and squeezed the juice into a bucket containing the latex. After stirring for 15 minutes, the liquid latex solidified into a white mass, pliable enough to be formed by hand into a ball. The researchers made a ball about 3.7 inches (9.5 cm) in diameter and, lo and behold, it bounced! When they used nuclear magnetic resonance scans to examine rubber balls dating back to 1600 B.C. that had been found in Veracruz and Chiapas, they were able to conclude that these had been made in a similar way. Is it really surprising that pre-Columbian Indians discovered this chemical trick thousands of years ago? Well, perhaps not as surprising as you may think, since the two plants, Castilla elastica and Ipomoea alba often grow in close proximity. In fact, the Morning Glory vine often twines itself around the rubber tree, making it quite likely that a careless rubber tapper accidentally contaminated the latex being collected with a little (crushed) Morning Glory vine: an accident that turned out to have incredibly serendipitous results. Sports are not specifically discussed in Geo-Mexico, but the music, dance, language and cuisine of Mexico, together with cultural regions, are discussed in chapter18 of Geo-Mexico: the geography and dynamics of modern Mexico. Forget modern “traditions” like the World Series! Forget soccer, tennis and golf! By far the oldest ballgame in the Americas is the little known game of Ulama. Amazingly, this game is still played in some regions of Mexico, where it is believed to have originated more than 3000 years ago! The original ballgame, played by the Aztecs and other Nahuatl speaking peoples in Mexico at the time of the Spanish Conquest, was known as Ullamaliztli, a name deriving from ullama, which means the playing of a game with a ball, and ulli, rubber. Many archaeological sites in Mexico boast the ruins of one or more ballcourts where the game was played and hundreds of representations are known in Pre-Columbian art of ballgame players with their characteristic protective gear, some dating as far back as 1500 B.C. The protective padding was necessary because the solid rubber ball used in the game weighed five to eight pounds (2 – 3 kilos) and was propelled at speeds of up to 95 kph (60 mph). While most ballgame relics are of single players, one polished clay model found in the state of Nayarit actually depicts a game in progress. Before you say “What a load of (old) balls!”, consider the fact that the ballgame has had profound consequences on sports all around the world. When the Spanish conquistador Hernán Cortés returned to Spain in 1528, he took with him ballplayers who demonstrated their skills at the court of King Charles V. The rubber ball they used amazed the Europeans as much as the game itself, since it bounced much more than the hair-stuffed leather balls in use at the time in Europe. The smuggling of the first rubber seeds out of Brazil led to rubber-tree plantations being established in Malaysia and rubber quickly became a world commodity, with the widespread uses we know today. The research establishing the links between the relatively modern versions of Ulama, played in Sinaloa, and the pre-Columbian game of Ullamaliztli was carried out by Dr. Ted Leyenaar of the Rijksmuseum voor Volkenkunde in Leiden, Holland. Emphasizing the game’s immense historical importance, he says, “That the Mesoamerican ballgame has survived and flourished for more than 3000 years earns it the distinction of being one of humanity’s great cultural expressions”. The details, meaning and significance of the game are explored more fully on the Mazatlán Historical Society’s webpages at http://www.ulama.org, the main source for this article. The Society is hoping to set up the world’s first Ulama Museum and has begun collecting related artifacts. “A load of old balls!”? – I don’t think so! This is an edited version of an article originally published on MexConnect. “Indigenous peoples” is the title of chapter 10 of Geo-Mexico: the geography and dynamics of modern Mexico and “Mexico’s cultural landscape” is the title of chapter 13. Map the locations of Mexico’s top fútbol (soccer) clubs. To what extent do these locations match a map of Mexico’s population density (Figure 8.2 in Geo-Mexico)? Does it appear that factors such as GDP/capita (Figure 14.3) or Mexico’s highway system (Figure 17.3) have also influenced where the top soccer clubs are located? Suggest what other factors may have influenced where Mexico’s soccer clubs are located. Mexico’s top yachtsman wins the first round-the-world yacht race. Other Comments Off on Mexico’s top yachtsman wins the first round-the-world yacht race. The first Whitbread Round-The-World yacht race was won by a Mexican. Most people do not associate Mexico and Mexicans with yachting, but it’s a fact that the first Whitbread Round-The-World Yacht Race, in 1973-4, was won by the Mexican ketch Sayula II, skippered by Ramón Carlin, a Mexican businessman who made his money from washing machines. What makes Carlin’s achievement all the more remarkable is that relatively few of Mexico’s 108 million inhabitants actually reside on the coast, even though the country is sandwiched between the Gulf of Mexico and the Pacific Ocean and actually has a long coastline. Most large Mexican cities are located in the interior. The nation’s capital, Mexico City, is unusual in being one of the very few major cities in the world not situated on the sea. Not surprisingly, then, when Carlin set out with Sayula II from Portsmouth, England, alongside 16 other yachts, in September 1973, the pundits did not give him any chance of victory. Most of the yachts in the race were European, and Europeans have completely dominated the race ever since. But Carlin, with his crew of 12 (including family, friends and some professional sailors from other countries) sailed off in their production line Swan 65 determined to do their best. And their best proved very good indeed. The 1973-4 race had four legs. Taking handicap into account, Sayula II came second in the first leg, Portsmouth to Cape Town, and then won the second leg, Cape Town to Sydney. This was a particularly remarkable achievement since this leg proved to be the hardest in the entire race, exposing all the competitors to unbelievably adverse weather in the Southern or Indian Ocean. Violent storms and 40-knot winds battered all the contestants and two yachts were forced to abandon the race. Sayula II capsized. Her cabin was filled with water and most of her crew, fortunately securely tethered, were swept overboard, sustaining numerous minor injuries. But the ketch survived and the crew soon had her under way again. From Sydney, the race took the yachts across the Pacific and round Cape Horn. Prior to the race, less than 10 private sports yachts had ever rounded Cape Horn successfully. It should also be remembered that Sayula II didn’t have the benefit of the thousands of dollars worth of modern navigational equipment, including GPS systems and transmitters for audio and video satellite communications, now considered standard on racing yachts. For the Sydney-Rio de Janeiro leg Sayula II came second, on handicap, and then placed fourth (on handicap) for the final leg across the Atlantic to Portsmouth. Carlin sailed the yacht across the finish line on April 9, 1974, and was declared the overall winner. Sayula II had taken 152 days (133 days on corrected time) to sail 32,500 nautical miles (about 60,000 kilometers). And, how did Carlin celebrate his unexpected victory? Well, in time-honored Mexican tradition, he donned a mariachi’s sombrero and partied, partied, partied! Source: The main inspiration and source for this article was “Sayula pusó la muestra” published on page 7 of the Guadalajara daily Público on July 26, 2001.